Image: Daily Mail front page, Saturday 1st December, fair use. 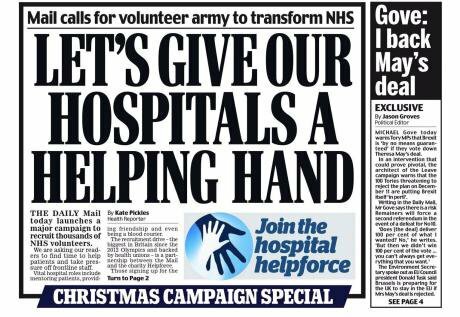 We, members of the RCN, have been concerned by the recent articles in the Daily Mail showing that our union is backing the campaign to find an army of volunteers to transform the NHS. We respect and value the fantastic work of volunteers in our NHS, and believe that volunteers deserve the utmost credit and thanks for their contributions. However, the idea of a volunteer army is not a new concept, nor will this be the last time we see it appear as long as our NHS remains chronically underfunded. Only a year ago, the Red Cross considered the state of the NHS to be a humanitarian crisis – this is not a job for charity or volunteers to fix, nor will they be able to. As such, we seek a more sustainable approach. The harms caused by bed and ambulance shortages and lack of safe staffing levels of Nurses, Doctors, and other healthcare professionals cannot be changed or bailed out by goodwill alone. Volunteers are wonderful, but are not the answer to this crisis, and they should not be used as political fodder by a tabloid newspaper to allow politicians and Chief Executives to avoid their responsibilities. The Daily Mail has a history of publishing bigoted and xenophobic rhetoric. There is no doubt that their editorial has helped contribute to EU nurses being made to feel unwelcome, which means many have left the NHS and the country. Furthermore, patients are regularly scapegoated in this paper for being the cause of excess demand on NHS resources, fuelling a culture of blame when the issue of capacity is not their fault. Additionally, nurses are regularly spoken about in a derogatory manner in the Daily Mail, which not only affects our professional image, but our morale as well. Therefore, it seems rather ironic for our professional body to be supporting a campaign to make the NHS a better place. Finally, it has been noted by members that asking people to work for minimal or zero recompense is a classic Conservative politician move, beginning in the UK with John Major’s “Community Action” scheme. A massive public campaign such as this risks pressurising people into volunteering, out of fear of being judged for not signing up, with the most vulnerable in society – those already struggling to get by, perhaps working more than one job – most at risk. The RCN prides itself on being a member-led organisation. After recent challenges within our union whereby we felt we were not being heard, we hoped that things may change. But with the backing of this campaign, we remain concerned over the lack of consultation. We have checked, and are unable to find or recall this being discussed with members, either at Congress or in the wider arena. We, the undersigned, would like to know who was involved in the discussion and signing off on backing this campaign, and when it was agreed. We are worried about associating ourselves with a newspaper that spreads so much division, and what in our view is a “sticking plaster solution” to treat symptoms (capacity) rather than the underlying cause (underfunding). Signed: Katie Sutton, Danielle Tiplady, Dan Langley, Jon Gardner (and a wide range of other RCN members).